Readers and scholars alike have been sharply divided over the recent discovery of a late-life revision of Hamlet (see the original news story here). Some applaud the opportunity to see Shakespeare's most famous play fully realized the way he ultimately envisioned it, while others condemn the changes and see no meaningful improvement over the version that is so familiar to them. We invite readers to cast their vote in the poll at the bottom of this page. Meanwhile, here is what four eminent Shakespeare scholars have to say about this controversial Hamlet. "Here’s the short and the long of it: this amazing Hamlet news is the biggest of the biggs in Shakespearean studies, yet people have secret plans to force it into being a Wedge issue. The haters doth protest too much, methinks." "The gratuitous changes in Hamlet: Special Edition make me so angry! And anger leads to hate, and hatred leads to suffering. If you prick us, do we not bleed?" "What exciting times we live in! We may yet recover the long-lost Hamlet Holiday Special, which Shakespeare did his best to repress after its first and only performance." "Yowza! What is a song and dance number doing in the middle of the third act? 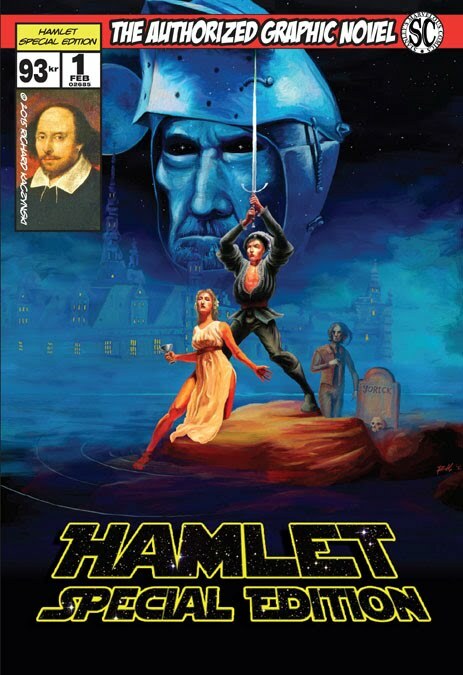 This is a bleeding Shakespearean tragedy, not some 'ooh la la' threepenny space opera. What a piece of work! Thanks for ruining my childhood." A newly-discovered version of Hamlet that Shakespeare revised late in his life— some twenty years after originally penning his beloved classic—was just uploaded to Wikibard and released as an ebook titled Hamlet: Special Edition. More. Dame Frances Beye-Cohn has authenticated a play recently uploaded anonymously to WikiBard as being written by William Shakespeare. More. Analysis of 400-year-old clay smoking pipes excavated from Shakespeare's garden and adjacent areas have tested positive for cannabis and cocaine. More. A copy of the First Folio was discovered in the holdings of a small public library in Saint-Omer in northern France. More. A Mainz University professor has identified two images as previously unknown portraits of Shakespeare. More. New York antiquarian book dealers Daniel Wechsler and George Koppelman are claiming that the heavily annotated 1580 dictionary that they won on ebay for $4,050 in April 2008 is actually Shakespeare’s personal copy. The Folger Library expresses skepticism. More. Copyright © 2015 Richard Kaczynski. You may also enjoy the novel The Billionth Monkey, of which this website is a virtual extension. Every effort has been made to ensure that the content of this website falls within the scope of fair use for humor, homage or social commentary, and is in compliance with the Digital Millennium Copyright Act (DMCA). Should you feel that any content on this website violates your copyrights, please direct your concerns to “webmaster” at the domain name wikibard.com.